Long before the waters and shores of what is known today as Canada’s Arctic archipelago were explored and surveyed, Europeans imagined a waterway connecting the Atlantic and Pacific oceans through or near the North Pole. But the archipelago shuttered hopes of easy passage. Its islands created conditions for longer sea-ice seasons and, together with continental shorelines, led to ice-clogged straits well into summer. Although the early European imagination lost out to geophysical reality, sea-ice melt accompanying 21st-century climate change has rekindled the prospect of navigation through the Northwest Passage. Projections indicate thinning ice in summer, sparking hopes for shorter inter-oceanic routes for cargo and new resource frontiers for mining, fishing, and the cruise-ship industry. Maritime administrators in the Canadian government have begun identifying corridors where shipping traffic may be directed, as well as areas and times where icebreaking would be necessary. However, this often has occurred without taking sufficient account of Inuit uses and understanding of these marine spaces. To embrace these worldviews is to fundamentally rethink the “frozen” nature of the Arctic archipelago and its many chokepoints. Unlike the shipping industry, which approaches sea ice as an obstacle and ice-prone straits as maritime chokepoints, Inuit and their predecessors have welcomed the presence of ice in narrow waterways as a surface that connects people, animals, land, and sea. The islands and the intricacies of the continental shorelines create conditions for most of Canada’s 23 polynyas (formations of open water surrounded by sea ice through the winter), as well as smaller but equally significant openings such as ice leads and cracks. Important to Inuit ways of life is the fact that open-water features surrounded by ice, such as polynyas, are biologically productive places where marine mammals who remain in the Arctic congregate throughout winter. As spaces of livelihood, Inuit have accessed these formations from camps and settlements on nearby shores, as well as by traveling and often living on landfast ice. 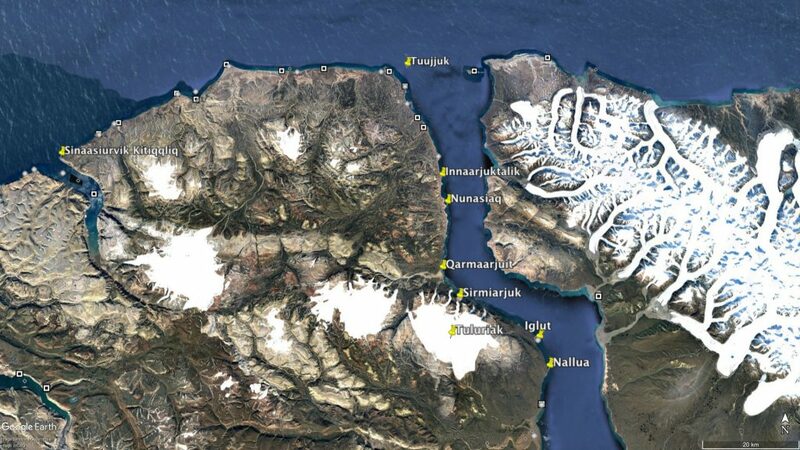 Ice-prone straits reveal radically different understandings of the Arctic. Here we explore how shipping industry and Inuit conceptions of sea ice relate and what their convergence might mean for governance. Conceptual tensions have manifested as two major developments in international law: one, the 2007 United Nations Declaration on the Rights of Indigenous Peoples (UNDRIP), particularly Article 3 (the right to self-determination); and, two, the growing international regulation of Arctic shipping by the International Maritime Organization, especially the International Code for Ships Operating in Polar Waters, effective January 2017. In the context of a changing planet, these two developments will guide changes in Arctic governance. Acutely aware of warming signs in the Arctic climate at least since the late 1970s, Inuit (and Inupiak) have been preparing for this historical moment by demanding their territorial rights to decision-making powers across legal arenas (Dorough 2017). Governmental agencies and shipping corporations now are challenged to honor and respect Inuit knowledge and ways of being. It remains to be seen, however, whether Inuit rights will help reshape shipping and navigational practices that have evolved largely on open, not icy, waters. Insofar as climate change creates opportunities for ships to navigate routes that they never could sail before, arctic chokepoints become sites for the negotiation of difference—particularly as global shipping routes converge on seasonally unfrozen spaces that Inuit use for hunting, fishing, and transport. Inuit terminology reveals a profoundly relational view of what ocean law experts would call “chokepoints” (Alexander 1992). Terms for sea-ice features, such as cracks and leads, often encode relative position to shores and floe edges, revealing an entanglement of sea and land in the core definition of sea ice. 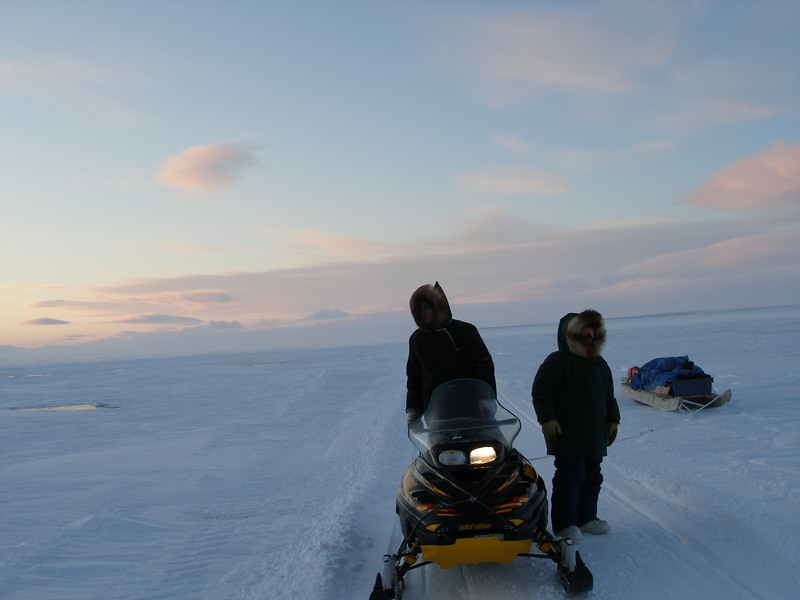 Traditional trails through the archipelago also reveal deep connections of land and sea in Inuit life (Aporta 2009). For example, sled trails transition between snow-covered land and sea several times over (figure 2). Meanwhile, summer walking trails and boat routes are intrinsically linked. Riverine watersheds mediate sea-land connections. The fresh-salt water relationship is critical to Inuit, who often establish camps at river mouths and who routinely travel across the frozen links offered by bays and fiords, creeks and rivers. Inuit elders in the community of Pond Inlet related how, in summer, they could tell their positions within Baffin Island’s interior by the direction the rivers flowed. Those flows structured spatial perception and identity, as rivers flowing west were considered part of Inuit Igloolik territory. The watershed allows anadromous fish (e.g., arctic char) to migrate between fresh water and sea, and also allows people to travel. 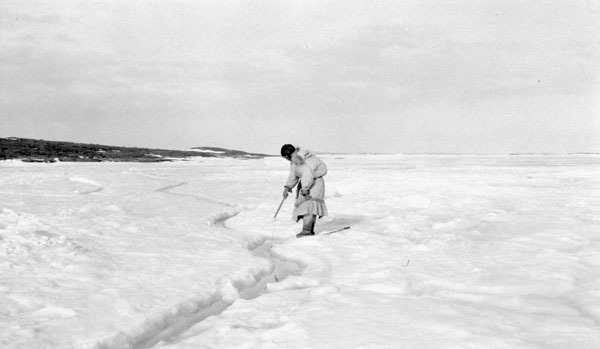 Land and sea are both understood to be part of Inuit territory, unsurprisingly, since landfast ice becomes an extension of land for most of the year in most areas. To Inuit, shores connect more than divide. A quick analysis of Inuit place names between present-day settlements of Arctic Bay and Pond Inlet, located on the north edge of Baffin Island along the southern shore of Lancaster Sound (see figure 3) illustrates the complex dynamics between land, sea, animals, weather, and people. All the place names on the map represent coastal features, and their meanings are associated with events, animals, and activities denoting interactions between land and ocean. Figure 3: Selection of place names on the southern shore of Lancaster Sound. Aporta and Inuit Heritage Trust. Marine salt-water spaces are defined less in terms of shoreline boundaries and more in relation to geophysical dynamics. While it is not uncommon for Inuit to name a stretch of sea in relation to a place name on shore (e.g., Salliarusiup Kangiqqlua refers to the Bay of Salliarusiq’s raised beaches), emphasis is placed on physical features relevant to mobility such as ice formation and breakup, currents, winds, topography of landfast ice, and presence and dynamics of open water. More than a bounded space open or closed to transit, for the Inuit the sea is a living environment in three significant ways: (a) it changes dramatically through the seasons; (b) it allows animals to thrive; and (c) if properly understood, it allows them both commerce and travel. Seasonality is a crucial component of Inuit residence patterns. Facing Lancaster Sound, the place name Tuujjuk refers to a small island campsite where the surrounding ice “keeps moving and hitting the shores” creating some open water where walrus, narwhal, and seals can be hunted. Caribou herds cross the sea ice in fall, while bird eggs are gathered from nests in summer when glaciers input fresh water into the sea. The land-sea interface is part of a continuum: coastal place names, camping sites, and well-established routes are connected strongly to Inuit uses of marine spaces, all of which change with the season. At once fluctuating and substantive, the sea-ice-land continuum is integral to the Inuit worldview. As such, it demands both recognition and protection as per the stipulations of UNDRIP and the Polar Codes. For mariners in the shipping industry, sea ice constitutes a barrier to mobility that threatens boat safety. Narrow straits and channels spatially constrain vessels bringing them into closer proximity to the coast and each other. In busy waters, the danger of collision is real (COLREGS, 1972). Many areas in the Arctic are not charted according to modern hydrographic standards and as a result there have been several groundings (Arctic Council 2009)—stark reminders of the dangers of navigating Arctic waters. Polar shipping is highly regulated (Polar Code 2015; Chircop 2016). Regulations govern a ship’s relation to sea ice in various ways. International Polar Class rules prescribe construction standards for ships, as well as equipment and crewing requirements needed to navigate different ice conditions safely (Polar Code 2015). Canada has divided Arctic waters into 16 shipping-safety control zones, each subject to different Polar Class and ice conditions (SSCZ 2010). There is nomenclature for ice, such as concentration of sea ice and type of ice (e.g., ice fields, icebergs, and growlers, all of which present unique hazards) (Canadian Coast Guard 2012). Safe navigation frequently involves some ice-breaking; icebreakers may be called in to open channels. Weather information services include reporting on ice conditions in real time. Shipping relies on distinctive knowledge, skill, and information. Both Canadian and international rules govern training of polar seafarers (STCW 1978). Ships entering Canadian Arctic waters are required to have an experienced ice navigator on board. They also must have access to meteorological and ice forecasts, all relevant charts, notices that update charts and navigational conditions, publications concerning ice navigation in Canadian Arctic waters, etc. (CCG 2012). These regulations for safe navigation establish technological requirements (including radar, electronic chart display information system and VHF communications from monitoring authorities such as NORDREG Canada). Rules also require maintenance of a proper lookout and safe speed in all visibility conditions as a matter of good seamanship (COLREGS 1972). Despite their dramatically different orientations to sea ice, the mobilities of the shipping industry and Inuit both depend on ice conditions that change seasonally. While shipping routes increasingly are navigable in summer, the shoulder seasons tend to be unpredictable. To compensate, vessel operators rely on notices to shipping, as well as ice and weather forecasts. At the beginning of every annual navigation season, the Canadian Coast Guard inspects navigation aids and usually has to place or reposition navigation buoys and other aids, as those left from the previous season likely will have shifted positions. Indeed, when the small cruise vessel Hanseatic ran aground in 1996, the captain’s mistake was relying on the location of a navigation buoy from the previous season (TSBC 1996). The Canadian Coast Guard recently has proposed a new focus on services dedicated to polar shipping, including icebreaking, within designated corridors in order to better utilize limited resources by concentrating the growing numbers of transiting ships (CCG 2014). This initiative spotlights the critical importance of understanding the conceptual tension we have highlighted here. While maritime regulators and ship operators approach narrow straits and channels as spatially constrained and potentially hazardous chokepoints, Inuit experience them as parts of a sea-ice-land continuum that defines their territories and lives. At present, Inuit communities and organizations are being involved gradually in conversations regarding Arctic shipping, but this engagement typically takes the form of community consultation rather than active participation in shipping governance. Nevertheless, spaces of conversation are being opened, as regulators attempt to align with Canada’s commitment to respecting indigenous rights as delineated in the UNDRIP. For example, on April 20, 2017, regulators, mariners, and Inuit leaders met at Dalhousie University to discuss issues related to shipping governance at an event convened jointly by the Company of Master Mariners of Canada and the Ice Law Project. The speakers reflected vastly different perspectives on Arctic waters, but also some commonalities. Both ship operators and Inuit understand that use of dynamic, fluid spaces depend on seasonally recurring events, as well as on yearly variations. Both groups utilize the space in summer, and open-water navigation involves ice avoidance for both. On the other hand, Inuit use of marine space is not dependent on the absence of ice. The presence and constitution of ice only defines how space is used. Inuit conceive marine space always in connection to life and to events on land. The shores that define the Canadian Arctic archipelago are not the margins of the marine/land space; on the contrary, they are the connectors between marine and land realms within which people and animals share a living. Inuit worldviews, in this regard, challenge conventional understandings of chokepoints. The lesson is clear: what is a chokepoint for some can be something very different for others. Looking ahead, the political, security, and economic significance of the Canadian Arctic archipelago will remain high. Yet the contemporary governance of Arctic shipping does not reflect fair recognition and accommodation of fundamental Inuit rights. To avoid or manage conflict between shipping and Inuit, tensions must be recognized and addressed. The concept of Arctic homeland is reflected in everyday Inuit life and in their political struggle to be recognized as players in the governance of Arctic waters. 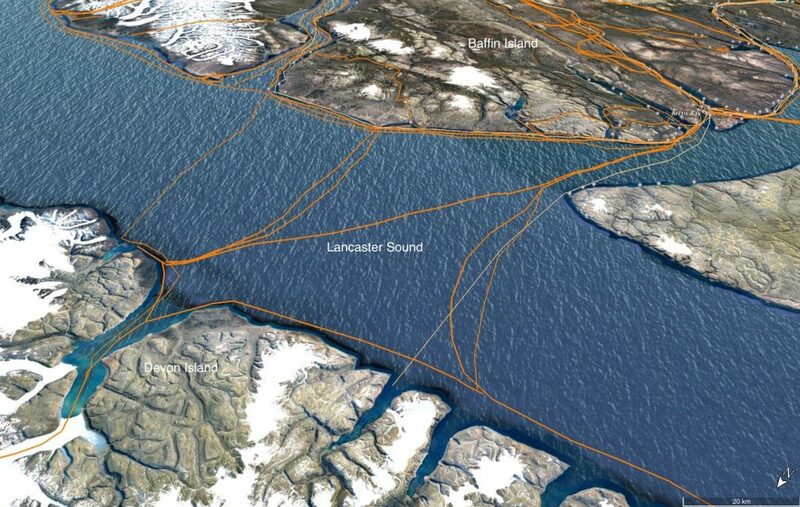 With infrastructural investment and political recognition, Arctic chokepoints (diversely conceived) can provide physical and conceptual spaces where indigenous rights and ship safety may perhaps find a more harmonious relationship in the Canadian Arctic. Alexander, Lewis M. 1992. “The Role of Choke Points in the Ocean Context.” GeoJournal 26(4): 503-509. Aporta, Claudio. 2009. “The Trail as Home: Inuit and Their Pan-Arctic Network of Routes.” Human Ecology, 37(2): 131-146. Arctic Council. 2009. “Arctic Marine Shipping Assessment 2009 Report.” Available at: link. CCG 2012 (Icebreaking Program, Maritime Services Canadian Coast Guard). Ice Navigation in Canadian Arctic Waters. Available at: link. CCG. 2014. Strategic and Management Priorities. < http://www.ccg-gcc.gc.ca/Publication/2014-2017-IBHRP/Section3-Strategic-and-Management-Priorities>. COLREGS. 1972. “Convention on the International Regulations for Preventing Collisions at Sea,” Oct. 20, 1972: 1050 UNTS 16; legislated in Canada as Collision Regulations, CRC, c. 1416. Ice Law Project (Migrations & Mobilities Subproject). 2017. “Qaqqaliaq: Going to the Hilltop to Scan.” Available at: link. Polar Code. 2015. International Code for Ships Operating in Polar Waters (Polar Code), Consolidated Text as adopted by International Maritime Organization Resolutions MSC.385(94) and MEPC.264(68). Ocean Yearbook, 31 (2017). Dorough, Dalee. 2017. 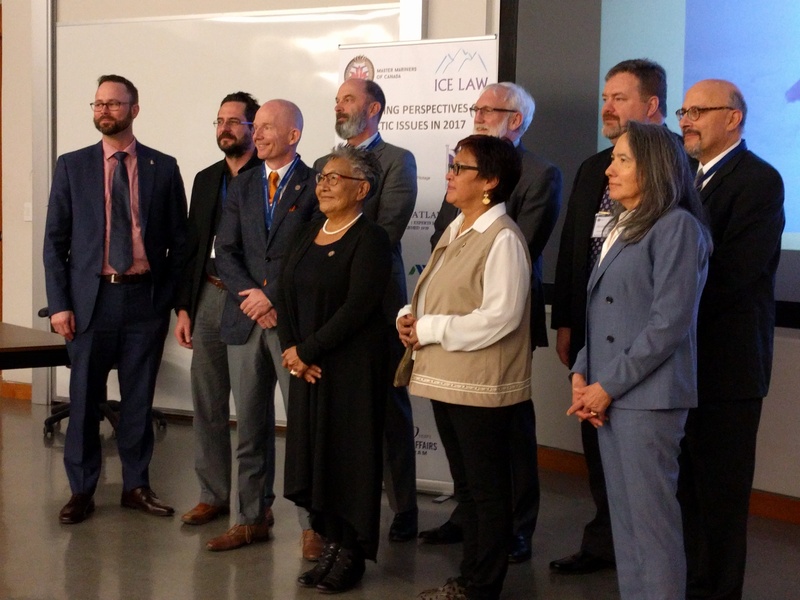 “Age-old stewardship and modern tools: The distinct status and rights of indigenous peoples.” Presented at Rethinking Perspectives on Arctic Issues in 2017, a seminar sponsored by the Ice Law Project and the Company of Master Mariners of Canada: Halifax, April 17. SSCZ. 2010. Shipping Safety Control Zones Order, CRC, c 356, as until last amended in 2010. STCW. 1978. International Convention on Standards of Training, Certification, and Watchkeeping for Seafarers, July 7, 1978, 1361 UNTS 2, as amended and the Seafarers’ Training, Certification and Watchkeeping (STCW) Code, IMO Doc MSC 96/3/2, Nov. 4, 2015. TSBC. 1996. Marine Occurrence Report: “Grounding Passenger Vessel ‘Hanseatic,’ Simpson Strait, Northwest Territories, 29 August 1996.” Transportation Safety Board Canada Report No. M96H0016.